During the past fifty years, colonial empires around the world have collapsed and vast areas that were once known as "colonies" have become known as "less developed countries" or "the third world." The idea of development—and the relationship it implies between industrialized, affluent nations and poor, emerging nations—has become the key to a new conceptual framework. Development has also become a vast industry, involving billions of dollars and a worldwide community of experts. 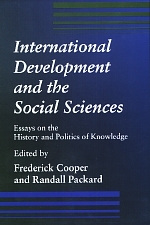 These essays—written by scholars in many fields—examine the production, transmission, and implementation of ideas about development within historical, political, and intellectual contexts, emphasizing the changing meanings of development over the past fifty years. The concept of development has come under attack in recent years both from those who see development as the imperialism of knowledge, imposing on the world a modernity that it does not necessarily want, and those who see development efforts as a distortion of the world market. These essays look beyond the polemics and focus on the diverse, contested, and changing meanings of development among social movements, national governments, international agencies, foundations, and scholars. Frederick Cooper is Charles Gibson Collegiate Professor of History at the University of Michigan. He is the author of Tensions of Empire: Colonial Cultures in a Bourgeois World (California, 1997) and Decolonization and African Society: The Labor Question in French and British Africa (1996). Randall Packard is Asa Griggs Candler Professor of History and International Health at Emory University. He is the author of White Plague, Black Labor: Tuberculosis and the Political Economy of Health and Disease in South Africa (California, 1989).